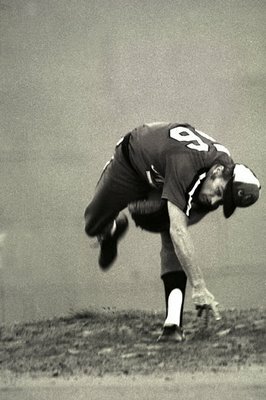 Ever seen a better picture of a pitcher? Jim Bouton by Ancil Nance. I asked Mike if he'd ever talked to Johnny Sain about contracts and he said he hadn't. Sain gives you good advice about how to get money out of a ballclub. John's a quiet guy and follows most of the baseball rules about keeping your mouth shut, but he's not afraid to ask for money if he thinks he deserves it. He was with the Boston Braves in 1948, the year they won the pennant. It was Spahn and Sain and then, dear Lord, two days of rain. Warren Spahn and Sain were the staff and Sain really put it to John Quinn, who was the general manager. Sain had had a big argument in the Spring about his contract and signed for less than he wanted. Now they were just home from a western trip and fighting for the pennant and Sain went to Quinn and said, "I'd like to talk about my contract." "We'll talk about your contract next winter, when it comes up," Quinn said. "No, I'd like to talk about it now," John said. "What the hell," Quinn said. "You signed a contract and we're going to stick by it. We can't renegotiate a contract during the season." "Well, we're going to renegotiate this one," John said. "What the hell do you mean by that?" Quinn said. "I'm supposed to pitch Thursday," Sain said. "But unless you pay me what I wanted in the beginning I'm not pitching." That meant it would be Spahn and rain and pray for a hurricane, and then maybe a flood. So Quinn tore up his contract and gave him a new one, and John won 24 games. He used to say to me, "Now, don't be afraid to climb those golden stairs. Go in there and get what you're worth." Funny that you brought up Spahn and Sain. I was sort of wondering to myself this morning about who was praying for rain the hardest, Detroit or St. Louis. When it comes to contracts, I think I read or heard somewhere that the winter after Mickey Mantle won the Triple Crown, the Yankees' intitial offer to him was $10,000.00 less than his last contract because his batting average dropped a few points from the previous year. All baseball players of today should say a prayer of thanks for Curt Flood when it comes contract time. Great photograph, and it is interesting how my mind showed me a picture of him hurling the "Lightzone" egg toward me. When Babe Ruth was at the height of his fame, he was making a huge amount of money, way more than most. More than the President, in fact. Someone asked him why he could possibly be worth more than the Commander-in-Chief. He replied, "I had a better year". Good story, true or not! I read "Ball Four" a few years ago. Hard to believe that good ball players were making $25K a year in the 60's. Nearly all of them had jobs in the off-season. "Ball Four" was serialized in 'Stars and Stripes' when it first came out [late 60s?] . i thought it was hilarious and got the book so i could read the whole thing. then i read it maybe 15 years later & still thought it was great. wonder if i'd like it again? I've never seen a better picture of a pitcher and I doubt I ever will. Thanks for this one. I'll bet you would. Some old friends are worth revisiting. Everybody should have a few books that they re-read a few times at different times in life. "Ball Four" is certainly a great book. Not much of a baseball fan (World Series? Eh, something to watch during the week in between football games) but the quote did remind me of how pro photogs don't stick up for their worth. Many will practically pay for the privilege of taking a picture even when they're specifically chosen and called for a job, sell prints for the cost of the paper, or give up their copyrights for a couple of bucks in the short term. A little negotiation coaching would do a lot of us some good. I was pondering on how good the picture is (incredibly good), and how did the empty space top left of it play. First look mechanically I thought "that's not really well framed". But then it kind of started adding to the picture. Might it be that the empty space in this particular sequence of movements has a weight because the player was there? I mean, if caught a split second before he would be using much of the space. Framing tight would give a less dynamic idea, while the just-emptied space enhances the movement impression, what do you think? I'd never seen that Bobby Orr picture before. Nice story, too. Thanks.